April 2018 www.coalage.com 5 news continued w o r l d n e w s Continued on p. 6... top 10 coal-producing states (in Thousand Short Tons) Week Ending (3/31/18) YTD '18 YTD '17 % Change Wyoming 50,523 50,732 -0.4 West Virginia 23,610 23,684 -0.3 Pennsylvania 12,527 12,595 -0.5 Illinois 12,446 12,683 -1.9 Kentucky 10,754 11,443 -6.0 Indiana 7,816 8,386 -6.8 Texas 7,760 8,737 -11.2 Montana 7,758 7,243 7.1 North Dakota 6,655 7,234 -8.0 Colorado 4,421 3,784 16.8 U.S. Total 191,097 197,033 -3.0 buildings and structures, machinery and equipment, and other related assets are not expected to generate future positive cash flows." It was not supposed to be this way. Once one of the most promising of Foresight's assets, Deer Run had just wrapped up its best year in 2014 when it produced 5.5 million tons of steam coal when the mine was ordered closed by the federal Mine Safety and Health Administration (MSHA) on March 26, 2015, after elevated levels of carbon monoxide were detected. That triggered a multiyear effort by Foresight to find and eliminate the cause of the CO exceedances. Deer Run produced only 1.8 million tons in 2016 and virtually nothing in 2017 and 2018. During that time, Foresight was acquired by Murray Energy, the largest privately owned coal company in the U.S. 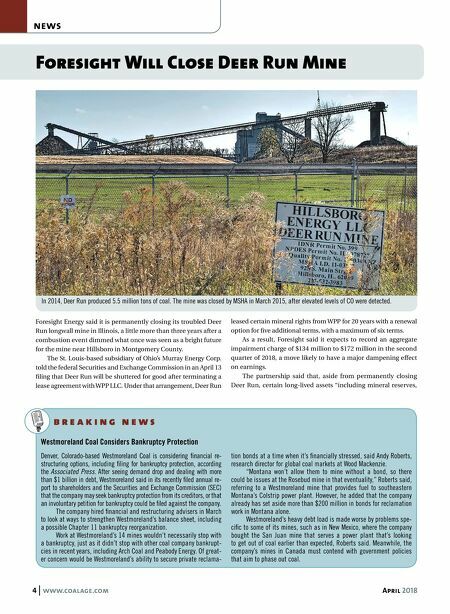 Early this year, Foresight received MSHA approval to essen- tially perform any work it chose in Deer Run, except mining coal. Gary Broadbent, Murray's senior corporate counsel and di- rector of investor and media relations, said he had no comment beyond the SEC filing. FirstEnergy Subsidiaries File for Bankruptcy On March 31, FirstEnergy Corp. announced its subsidiaries, FirstEnergy Solutions (FES) and FirstEnergy Nuclear Operating Co., filed for bankruptcy. FirstEnergy will exit the generation business and become a fully regulated utility company, the com- pany said. "FirstEnergy and its other subsidiaries are not part of this Chapter 11 filing," said Charles E. Jones, president and chief exec- utive officer of FirstEnergy. "The 6 million customers of our reg- ulated utilities will continue to receive the same reliable service, while our regulated generation facilities will continue normal op- erations, with the same longstanding commitment to safety and the environment. "FirstEnergy will remain focused on creating long-term value for its customers, employees and shareholders," Jones said. "Becoming a fully regulated utility company should give First- Energy a stronger balance sheet, solid cash flows and more predictable earnings." Severstal Capitalizes on Demand for Coking Coal and Steel With increasing prices for its products offsetting softening sales volumes, Russian steel and metallurgical coal miner Severstal said its group revenue remained almost flat quarter-to-quarter at $2.173 billion (Q4 2017: $2.178 billion). "Our financial per- formance in Q1 2018 was supported by a strong export pricing environment and Severstal's flexible distribution channels, which enabled us to redirect higher volumes to export markets," said Alexander Shevelev, CEO of Severstal Management. "In 2018, we continue to forecast global steel growth. Russian steel demand in- creased 5% in 2017 and is expected to be a further 2.6% higher in 2018, supported by GDP growth and gradual economic recovery." Russia remains Severstal's core market and the company has the flexibility to redistribute shipments quickly between domestic and export markets. The company said coking coal sales from Vorkutaugol declined 25% quarter-to-quarter. A longwall move at the Vorgashorskaya mine impacted production. Iron-ore pellet sales decreased 28% and totaled 2.38 million metric tons (mt) compared to Q4 2017's 3.3 mil- lion mt. Iron-ore concentrate sales increased 14% quarter-to-quarter to 1.29 million mt (Q4 2017: 1.14 million mt), despite a seasonal slowdown in production at Olcon. The improvement of iron-ore con- centrate sales in Q1 2018 reflects the consolidation of the Yakovlevs- kiy mine and a stock sell-off at Olcon. Coal Carrier Capsizes in Bangladesh A coal-laden cargo ship carrying 775 metric tons (mt) of coal cap- sized in the Pashur River in Mongla upazila near the Sundarbans, Bangladesh. Commander Oli Ullah, harbor master of Mongla Port, said, "Jashore-bound 'MV-Bilash' capsized in the river around 10 p.m. [April 16] after loading coal from mother vessel MV-Observatory at the port. The incident occurred as the cargo was following a wrong route and stuck in a hidden char (island)." The Mongla Coast Guard and a salvage vessel rescued seven sailors from the capsized vessel. The Port of Mongla is one of the busiest ports in the world. Struggling South African Mines Sign Offtake Deal Under a 12-month trading offtake agreement, South Africa's Opti- mum and Koornfontein coal mines will supply at least 200,000 met - ric tons (mt) per month to Vitol, a commodities trading firm. The deal will help save the mines from liquidation. To facilitate the coal supply agreement, business rescuers Louis Klopper and Kurt Knoop entered a 12-month management agreement with investment firm Burgh Group and its operations division Ezimbiwayo Consulting. The deal, according to Argus Energy, marked a victory for Vitol and Burgh, which last year abandoned attempts to obtain Optimum's 8-million-mt-per-year export allocation at the Richards Bay Coal Terminal (RBCT). Optimum Holdings is controlled by Tegeta Exploration and Re- sources, which is owned by the Gupta family. The Guptas reportedly fled South Africa in February to avoid prosecution over their alleged involvement in widespread government corruption. 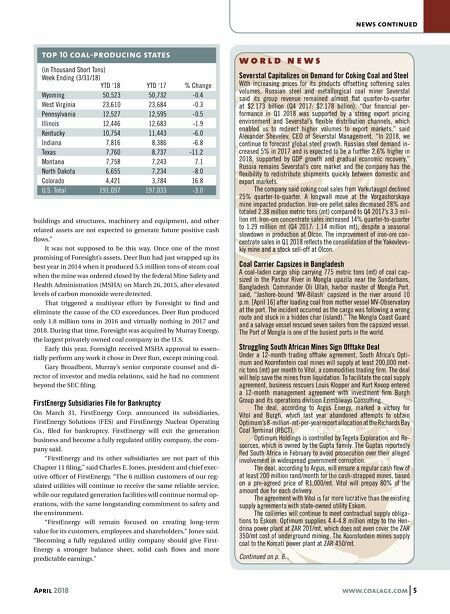 The deal, according to Argus, will ensure a regular cash flow of at least 200 million rand/month for the cash-strapped mines, based on a pre-agreed price of R1,000/mt. Vitol will prepay 80% of the amount due for each delivery. The agreement with Vitol is far more lucrative than the existing supply agreements with state-owned utility Eskom. The collieries will continue to meet contractual supply obliga- tions to Eskom. Optimum supplies 4.4-4.8 million mtpy to the Hen- drina power plant at ZAR 201/mt, which does not even cover the ZAR 350/mt cost of underground mining. The Koornfontein mines supply coal to the Komati power plant at ZAR 450/mt.